A unique complex nanostructure, Bi2Fe4O9 nanotube decorated with iron-rich nanorings along the tube axis, has been fabricated by sol-gel synthesis in porous anodic alumina membranes and characterized in detail by scanning electron microscopy (SEM), X-ray diffractometry (XRD) and transmission electron microscopy (TEM). Rayleigh instability of the precursor sol upon thermal annealing is proposed to be responsible for the formation of this unique complex nanostructure. 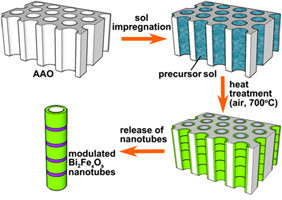 The as-fabricated Bi2Fe4O9 nanotube arrays exhibit a room temperature ferroelectric behavior, which may find potential applications in the next generation ferroelectric devices.